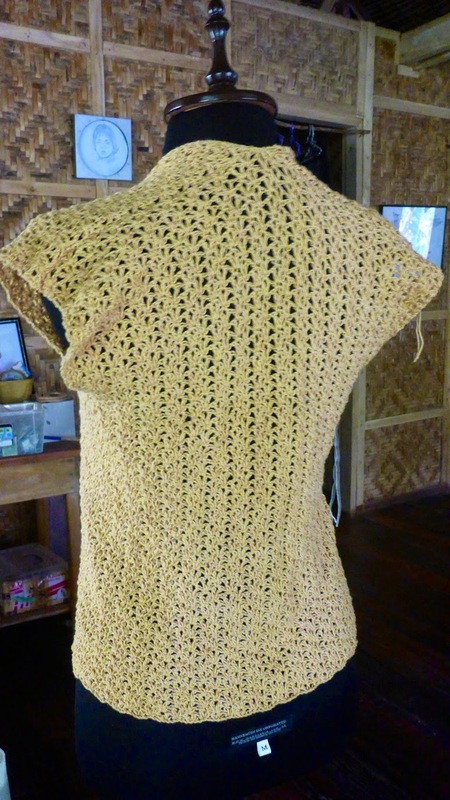 This is a very easy and simple crochet cardigan I made for my sister. My sister likes simple designs, nothing too flashy. 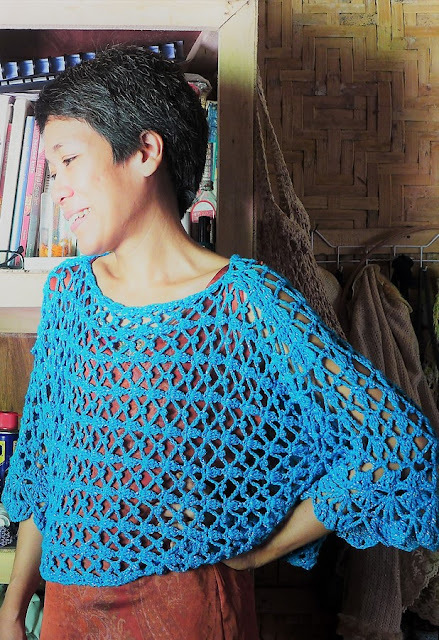 She also prefers close-weave crochet fabric, not crochet fabric that has lots of large holes. 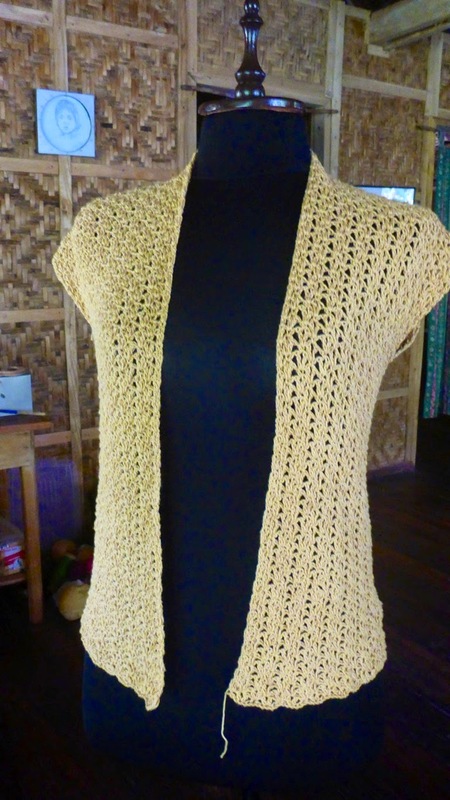 I thought of this very simple design for a cardigan using a simple close-weave lace pattern. Here (below) is the stitch pattern that I used for the cardigan. It is from a book called "Stitchionary 4" I got from a store in Manila more than 10 years ago. 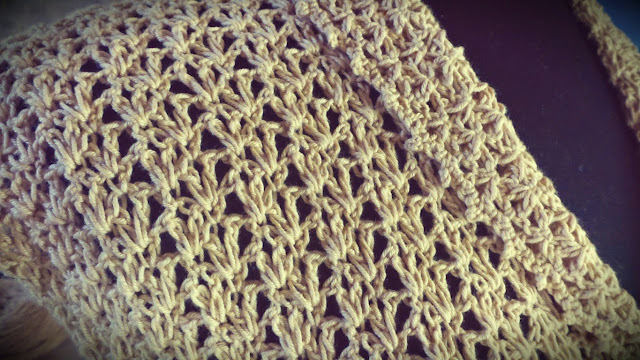 The stitch pattern is worked over a foundation of 6 sts +2. 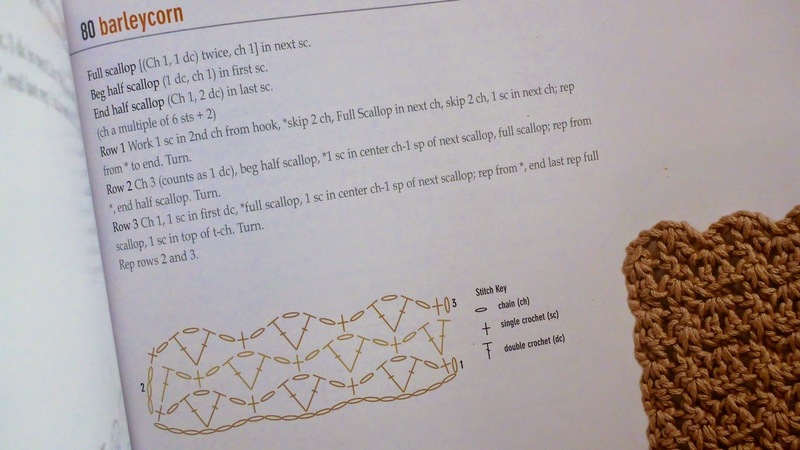 If you have a stitch dictionary and would like to use it to make finished items and garments, then this project can help you get started. 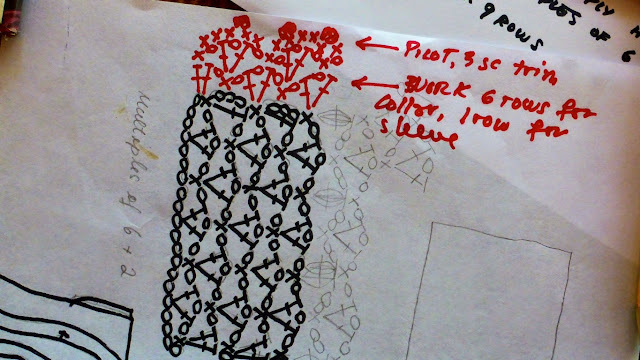 There's another similar project on Using A Stitch Pattern to Make A Mini Dress. 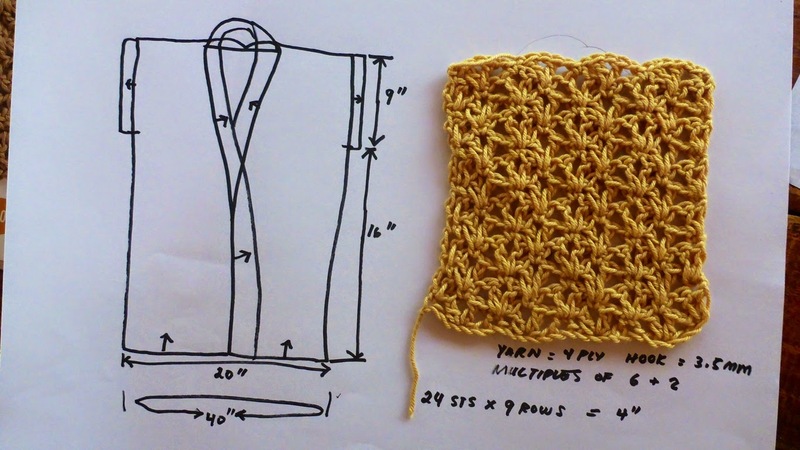 After selecting the stitch pattern, I made a gauge swatch using the hook and yarn I have selected for the cardigan. 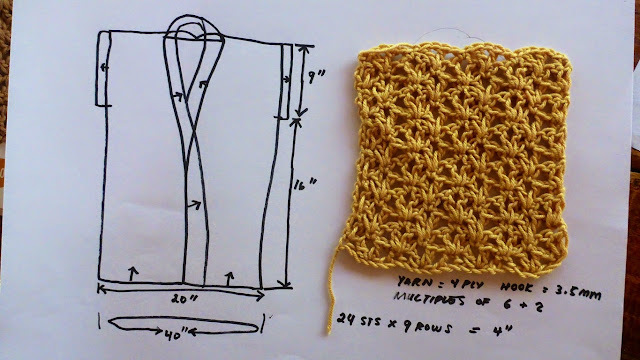 I also made a simple schematic for the cardigan and from there, determine how many stitches I will need to make the size I want. These three photos below show the work in progress. I am using a 35" bust dress form. 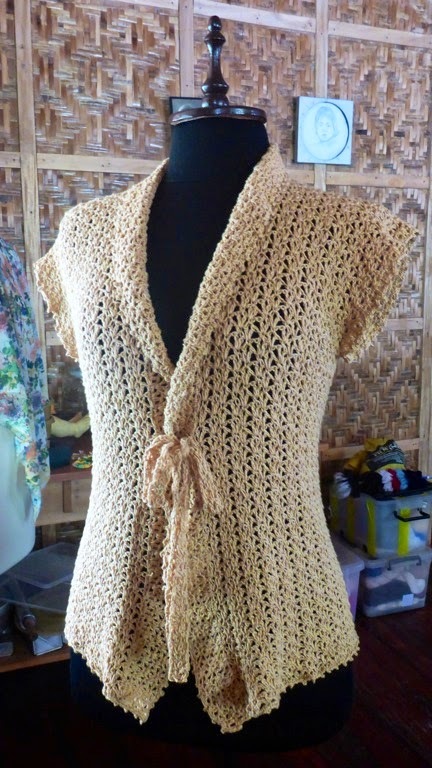 There is no shaping in the design of this cardigan so it is very easy to make, Work begins at the bottom, going up, so the cardigan is seamless. There is a split for the armholes then the right and left front are attached to the back at the shoulders. 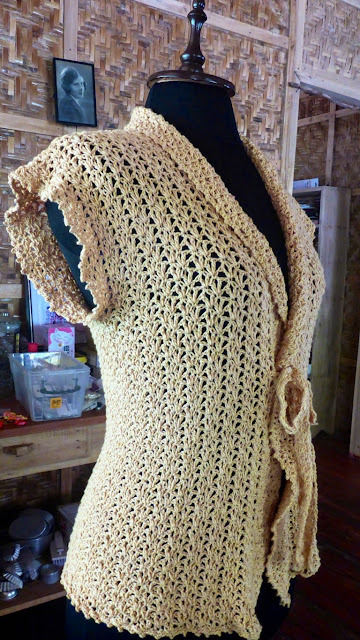 The next part is to make the collar of the cardigan. 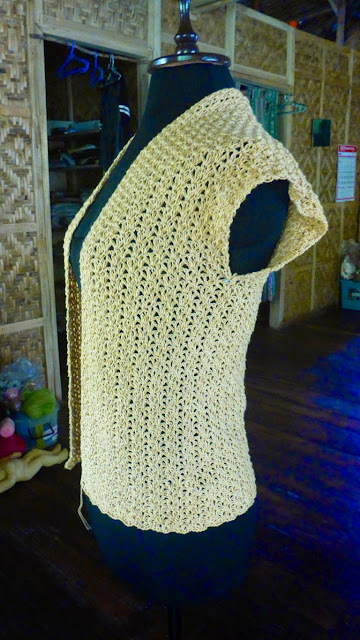 I used the same stitch pattern worked along the rows of the front of the cardigan and around the back of the neck. The collar is 6 rows wide and ends with a simple trim of 3sc-picot. Here (below) is a quick presentation of the stitch pattern (in red) for the collar, also used for the sleeve trim. Here below are detailed photos of the collar. The last row of sc-picot is worked all around the cardigan including the hem. 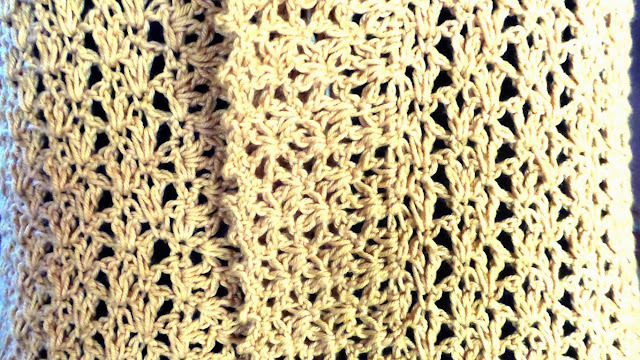 I used the same stitch, one row then the sc-picot trim, all along the armholes. Instead of buttons, I decided to make ties that attach to the front of the cardigan, shown below. The ties are simply one pattern repeat of the basic stitch pattern. 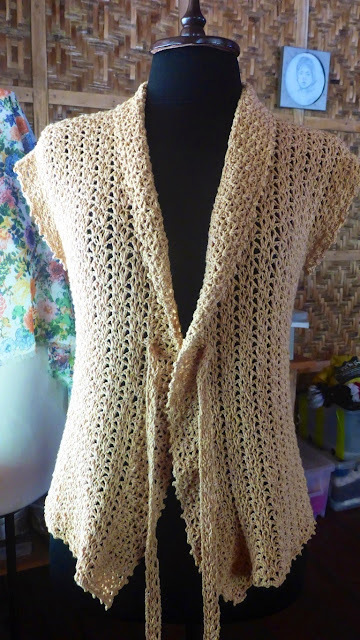 The finished cardigan (below) fits bust size 32"-36" and can be worn over a simple top or even a pretty bra top. 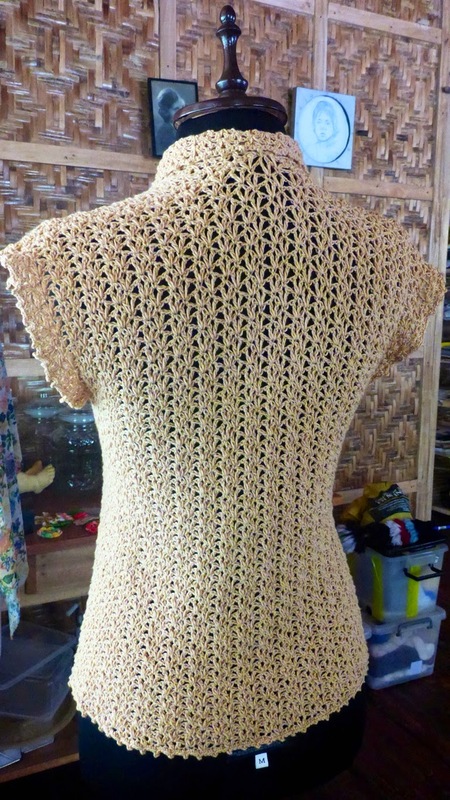 The construction of this cardigan is one piece, seamless, and very simple. I'm missing out on how to read patterns.... *sad* Again this is an amazing design, you nailed it. One day i wish to meet you, Amen. hi! it's a lovely project! not sure if i could do this but i'm saving it to try tonight. lol... i can't read symbols too so i guess tonight's gonna be one hell of a night! can't hardly wait!!! hi! it's the 3rd times i typed, i always forgot to sign-in to my account so i guess the first 2 comments are lost. it's a lovely project, not sure i could do it but i'm saving it to try tonight. i can't read patterns as well so i guess tonight's gonna be one hell of a night! lol... can't hardly wait! just a light request, would u mind next time to make a tutorial video about the project u're working in? You are an awesome lady!! Just seeing your patterns and how you share your knowledge freely (hoping for supporters of course). I love your Crochet. I'm just now considering designing my own pieces. I don't know why, but it does seem like such a challenge. That's why I'm starting out with sleeveless shrugs. A pattern I can wrap my head around!! (One Rectangle piece, fold, sew ends where they meet) so I think I have found your blog at just the right time. I love your bralettes and boyshorts. I have just found your blog so I haven't yet had the chance to thoroughly look it over. I like what I see so far! Just wanted to thank you for sharing! So lovely !! Thanks for sharing !!! I will maike it soon !! It is beautiful work, and I'd really like to give it a shot. But I'm a lower intermediate crocheter. I have no idea how to turn this into a written pattern. Any suggestions?